I have owned this hoe for many, many years. There is nothing that can come close to it for taking care of weeds. 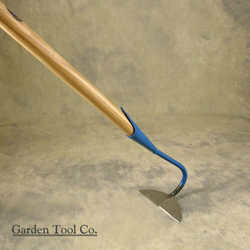 And actually I just checked and as of today Gardener's Supply has this hoe again. I believe that's where I bought mine. I looked on the Earthtools website and didn't see it there. It's expensive, but in my opinion is well worth it. I use one in my fields weeding around young plants, and it is significantly faster and easier to use than a conventional hoe. 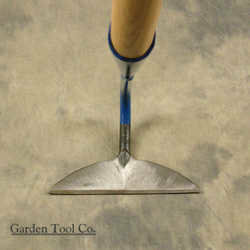 I use it on edge to root out grasses and just a sliding slice to take out most other weeds. I suggest keeping it as sharp as a knife. I've had one of these for about 15 years (maybe longer) and it's one of my favorite tools. So much so that I won't lend it out. To anyone. I hide it from my husband because he likes it, too---but he likes it for stuff like mixing concrete. It may be the perfect shape, but It's WAAAY to good for that! 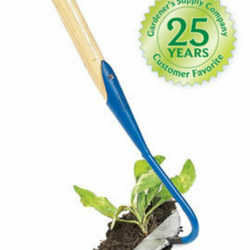 It skims along the soil surface like a scuffle hoe (but better) and the sharp corners are great for digging out root clumps. Yes, it's expensive, but mine is just as functional as the day I got it. My maintnence routine consists of running a file over the edge once or twice a year. As near as I can tell, Gardener's Supply is actually the manufacturer of this product. I've tried dozens of different weeding hand tools, and I believe that this one is my favorite of them all. The triangle head is very small and being parallel to the ground, it's incredibly easy to weed gardens. You can get around plants easily and even bermuda grass is no match for this. Quite expensive, but worth it.